Chelsea head coach Antonio Conte is adamant Arsenal are a Premier League title contender. The Gunners have lost two of their first four matches and the most recent away game prior to their trip to Stamford Bridge was a 4-0 loss at Liverpool, which reignited debate about Arsene Wenger's position as manager. 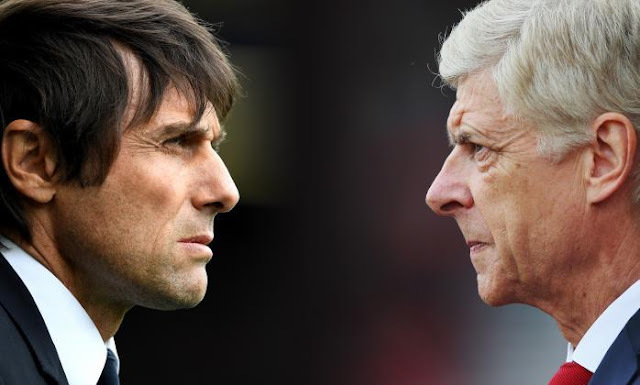 Arsenal have not won at Chelsea since October 2011 and have won two of 21 games against the established top six since the start of the 2013-14 season, but Conte feels the Gunners are a threat. "For sure Arsenal is a big rival for the title," he said. "If you see their squad you can understand there are a lot of top players. I don't understand why they can't fight for the title. "They lost only one player now, (Alex) Oxlade-Chamberlain. They kept all the players from last season. In their squad there are many top players. "I think Arsenal is one of the six top teams in England. "In England there are six top teams and when you play against one of them it's always a massive game. We have to fight." Conte rotated his options for Tuesday night's 6-0 Champions League win over Qarabag of Azerbaijan. He is likely to restore his leading players for the Arsenal clash, when Eden Hazard could make his first start of the season after recovering from a broken ankle. "The best target is to try to make the best decision for every game and try also to win," Conte added. "The answer of all my players in the last game was positive. I'm pleased for the commitment, for the performance of my players. "I have another day to check the physical condition of all my players. Then I'll try to make the best decision for the Arsenal game."